Hachiman is the Japanese Shinto god of war, tutelary god of warriors, and divine protector of Japan. One human, before he ascended into the respected ranks of the Shinto gods he was Ōjin, the 15th emperor of Japan. As a Shinto god (kami), Hachiman is immensely popular throughout Japan, about half of the registered Shintō shrines are thought to be dedicated to him. Two popular modern tourist attractions of such shrines incluse the Usa Shrine (Usa, Ōita) and the Iwashimizu Shrine (Yawata, Kyoto). 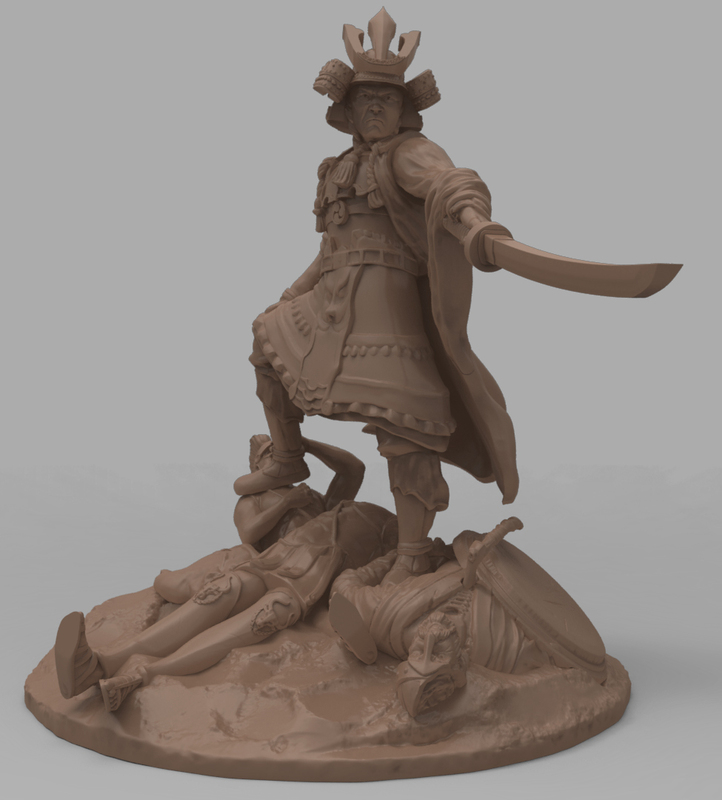 Sculpted by Australian artist David Sparrow, Hachiman is an exaggerated 28mm (31mm) scale, metal, multi-part miniature. 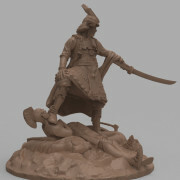 Like the Thor- the Norse god miniature, Hachiman is based on a 40mm base, inclusive of scenic elements, in this case some unfortunate foes from the Greek and Norse range. 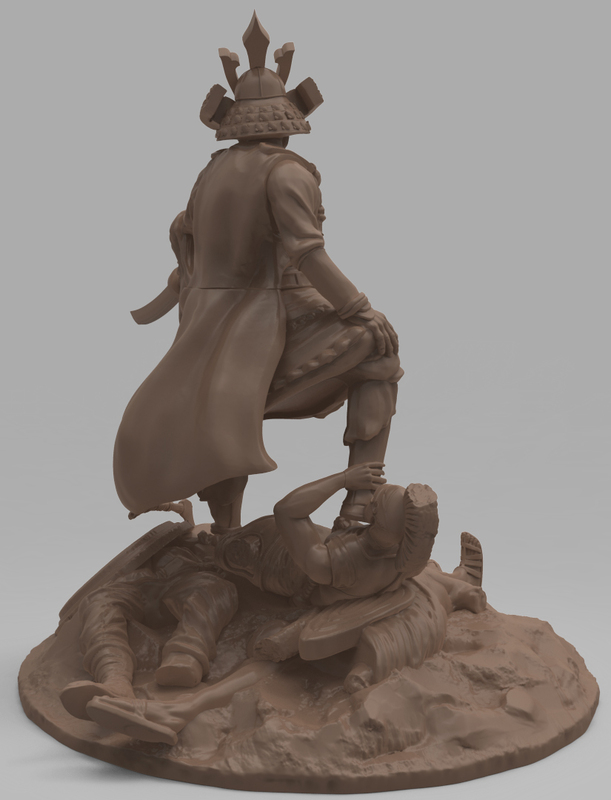 The 3D model is currently in our priority prototyping que and will have had its production moulding completed before we launch our upcoming crowd funding campaign. Bringing Hachiman to the tabletop brought with it several complex design challenges. Due to his popularity in Japan, it was important that the final model was both epic in its look and design but also respectful to the Japanese history and mythology around such an important Shinto kami. In our research there are two ways of portraying Hachiman as a Kami, the first is a more demonic look that we see fairly common in Japanese mythology, the other portrays him as a powerful samurai. As he is the tutelary god of warriors and an ancestor of the Minamoto samurai clan we opted for the samurai look. 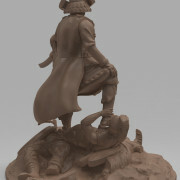 This look fit in better the range of miniatures whilst still yielding a pretty awesome miniature. This style is also a cleaner fit for the scenes he appears in in the games fiction. It was important to include key visual cues that link the miniature with the modern portrayals of Hachiman so we were sure to include the crest of Hachiman is in the design (a mitsudomoe) and took some design cues for his Armour from several of the Shinto shrine statutes of Hachiman. 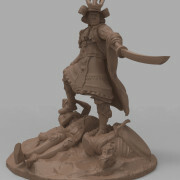 Hachiman will feature in the Japanese starter set alongside the Oni and several other key Japanese miniatures. hachiman is the 3rd God miniature to be previewed for Conquest fo the Gods, following the Norse god Thor and Egyptian god Horus. 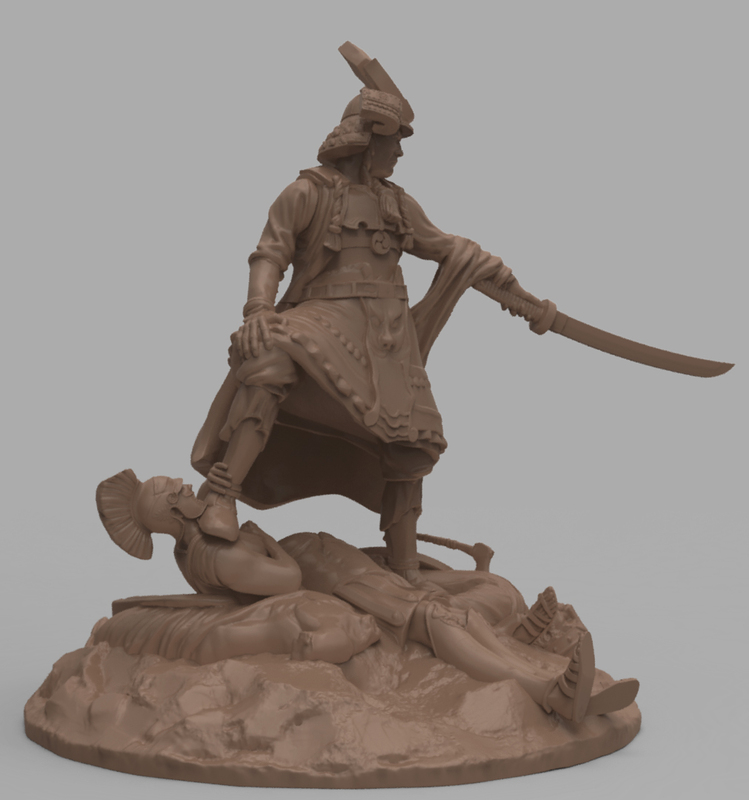 The final god miniature for preview is Ares the greek God of War, we hope to be showing Ares off in the coming weeks.